Updated 12:30pm 4/24/2015: Updated new SPC Day 2 graphics below and write-up. Old write-up is strikedthrough. Summary: Friday during the day looks nice, but rain coming in late. Saturday has an increased chance of severe weather during the afternoon hours. Note: We will update this post today as we see necessary. Also, expect tomorrow’s post earlier than normal as we will post it tonight and update it tomorrow morning after latest SPC updates. Enjoy the daylight hours today as we see a nice day shaping up, with a high of 68 degrees under mostly cloudy skies. Our winds are coming from the east-southeast at 5 to 10mph. Rain chances increase at about 6pm tonight with a round of showers and storms moving in and sticking around until daybreak Saturday. Tonight’s low will only fall 11 degrees to 57 degrees due to the rain, with an 80% chance of seeing rain at your house overnight. Winds turn to come out of the southwest overnight at 5mph. The overnight showers are not expected to be severe, however, could wake you up with some thunder. One or two might get strong enough to warrant attention, but that doesn’t seem to be the case right now. 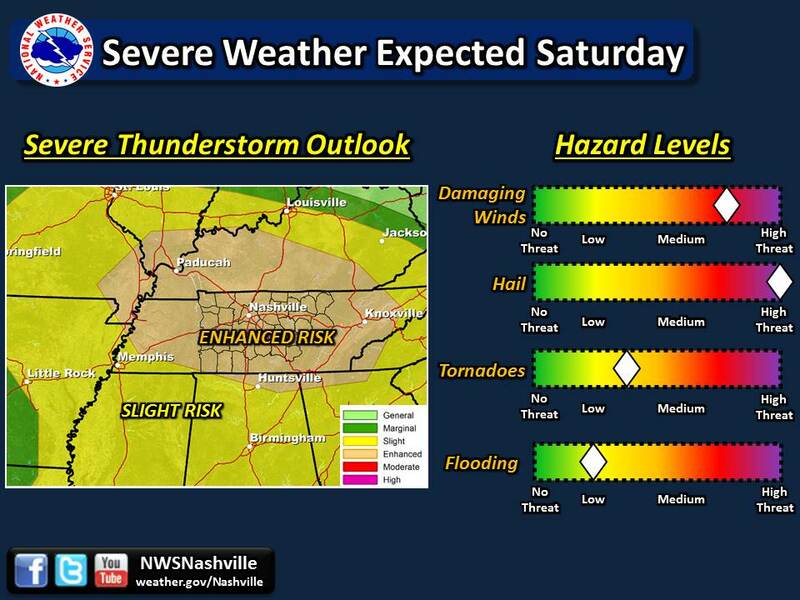 NWSNashville has posted this HAZARDOUS WEATHER OUTLOOK for Friday night through Saturday morning. THREATS FOR ALL OF MIDDLE TENNESSEE. 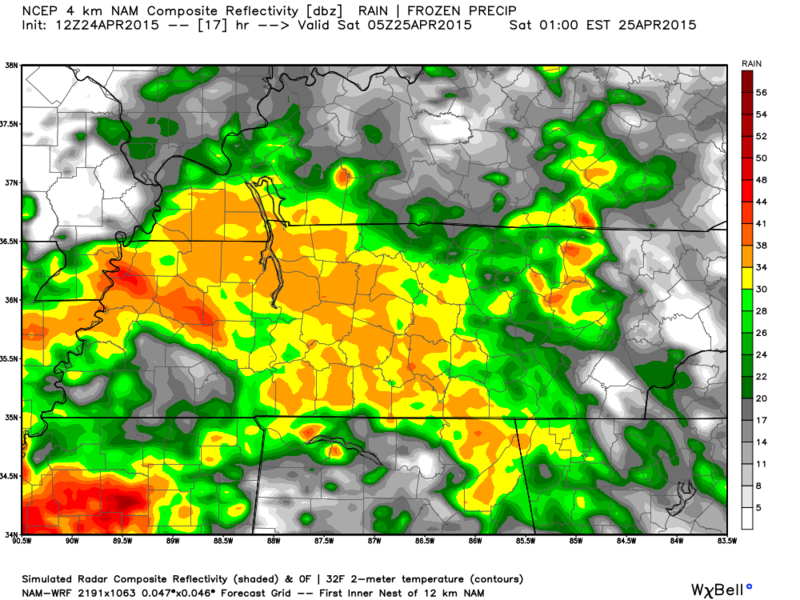 The NAM4 model’s simulated radar for 12am Friday night/Saturday morning. Saturday is the main focus: Severe weather threat with very large hail, damaging winds, and an isolated tornado or two possible. Saturday morning we will start off wet from overnight rain and spotty showers lingering. 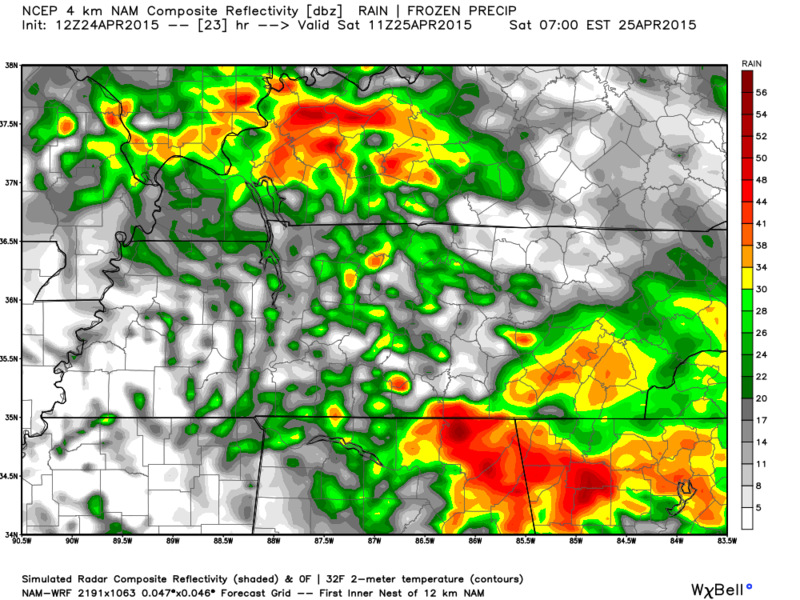 Below is the simulated radar from NAM4 that shows those spotty showers at 6am. The overnight and morning showers will clear out by noon on Saturday as our temps soar to 78 degrees with a 60% chance of rain today. Our winds continue to come out of the southeast at 10-15mph during the morning, then coming out of the southwest at 10-15mph in the afternoon. Saturday afternoon and early evening is the biggest chance for severe weather for Hickman County and Middle Tennessee in general. With the morning rain clearing out, this opens the skies to sun and daytime heating, setting the stage for severe weather ahead of a strong cold front expected to move in overnight Saturday and into Sunday. Note: Pictures say a thousand words, so I’m about to post a lot of pictures since they say can say it better and quicker. Currently, the SPC has us outlooked in the ENHANCED category for severe weather starting Saturday 7am to Sunday 7am. The ENHANCED category is right over Middle Tennessee and Southern West and Central Kentucky. 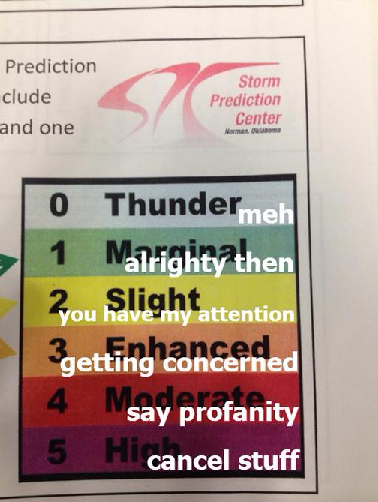 Note: we wouldn’t be surprised if we get bumped up into the MODERATE category for tomorrow. Updated 12:30pm 4/24/2015: Some good news. The SPC has removed us from the ENHANCED category for tomorrow and placed us in the SLIGHT category. Updated image below. This could change again before tomorrow. 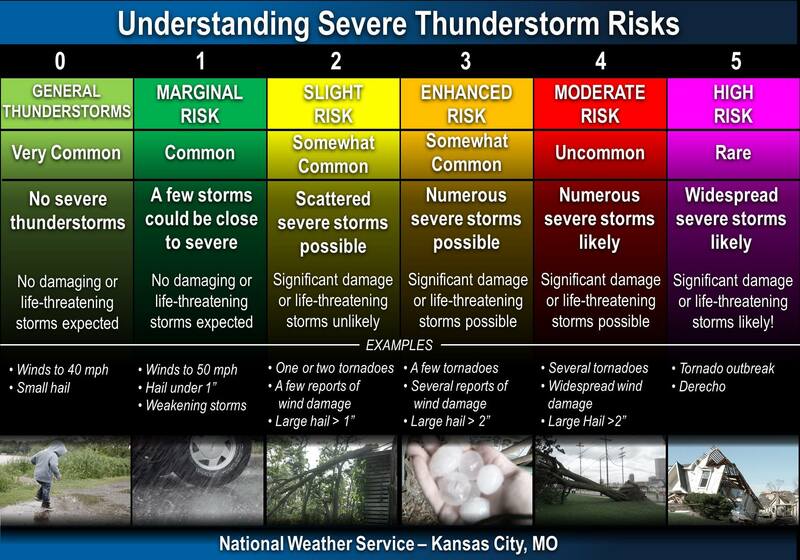 Also, here’s a more detailed description of the severe weather categories. The SPC has also released this outlook as well for Saturday for us. Updated 12:30pm 4/24/2015: Updated image below. This means there is a 30% chance of seeing severe weather within 25 miles of a point (the red area) and a 10% or greater chance of seeing significant severe weather within 25 miles of a point (the hatched area). Updated 12:30pm 4/24/2015: The SPC now believes Hickman County has a 15% chance of seeing severe weather within 25 miles of a point, and has removed us from the hatched “significant severe weather” area. Again, this could change before tomorrow. The NWS in Nashville has released this graphic outlining specifically the threats for Middle Tennessee. Main threats include very large hail, damaging winds, isolated tornadoes, and flooding. They’ve also released this video that talks about this graphic and the threat of weather tomorrow. Update 4/24/2015 12:30pm: This graphic is now out of date with the new SPC categorial outlook images above. The hazard levels, however, are still mostl accurate. Update 12:30pm 4/24/2015: The NWSNashville released this new graphic with the latest SPC update, showing Hickman County now in the SLIGHT risk category. WIND AND LARGE HAIL BUT ALSO ISOLATED TORNADOES. Strong to severe storms are expected to pop up during the afternoon and early evening (noon to 8pm) with the (1) daytime heating, (2) very warm moist air brought in by a warm front, (3) winds coming out of the southwest pumping in more instability, and (4) leftover energy and instability from Saturday morning’s rain. All four of these are ingredients for severe weather. Early afternoon storms will see the greatest threats be very large hail and damaging winds. After about 4pm, however, the threat of isolated tornadoes increase as these supercells could intensify enough to put down a tornado or two. Storms will then start to form a line ahead of the cold front as the nighttime hours come around. 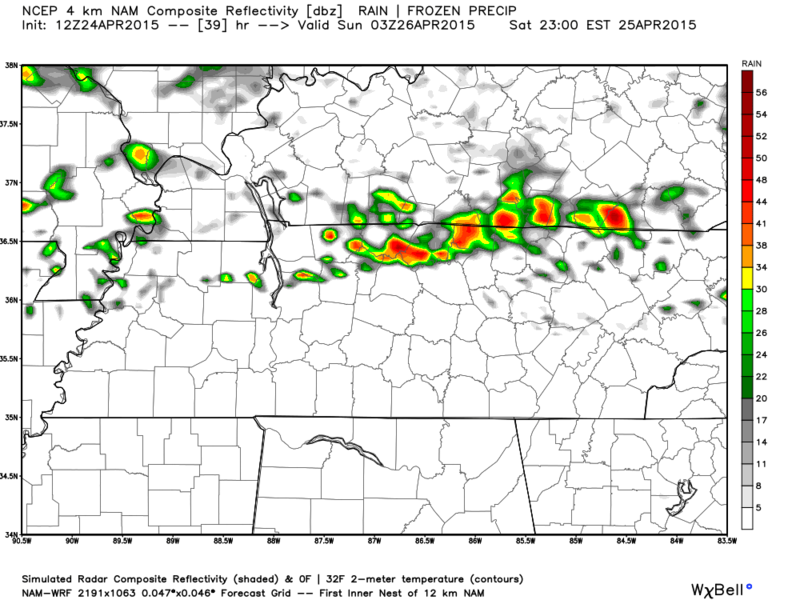 This is NAM4’s simulated radar for 10pm Saturday night, outlining the line of storms ahead of the cold front. Come midnight Saturday night/Sunday morning, our severe weather chances should be pretty much out of our area. Now is the time to get your severe weather plan in place. If you don’t already have a severe weather plan in place, now is the time to do it. Since the biggest threat tomorrow is damaging winds and very large hail (2 inches or greater in diameter is not out of the question), it is wise to look for ways to protect your personal property and pets. Bring patio and lawn furniture (especially tables with glass tops) inside or under a roof for safekeeping if at all possible. Store your cards in your garage if you can. Find a way to bring your pets inside tomorrow or provide adequate shelter for them. Hail stones can not only damage your personal property and break windows/glass, it can also really hurt your pets. For other severe weather preps, including tornado preparation, you can read our writeup on what to do when severe weather is forecasted. The NWSNashville also has published a severe weather checklist that you can read through to prepare you and your family.